Ginger Rogers (July 16, 1911 – April 25, 1995) was an Academy Award-winning American film and stage actress and singer. In a career spanning fifty years, she made a total of seventy-three films. 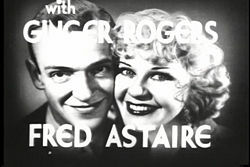 Rogers was most famous for her partnership with Fred Astaire. Together they made nine musical films at RKO and in so doing, revolutionized the Hollywood musical, introducing dance routines of unprecedented elegance and virtuosity, set to songs specially composed for them by the greatest popular song composers of the day, and performed in some of the most glamorous Art Deco-inspired sets ever seen on film. To this day, "Fred and Ginger" remains an almost automatic reference for any successful dance partnership. Virginia (Ginger) Katherine McMath was born in Independence, Missouri, the daughter of Eddins and Lela Owens McMath. Her mother separated from Rogers' father soon after her birth, and went to live with the Walter Owens family in nearby Kansas City. Her parents divorced and fought for custody, with her father even kidnapping her twice. After they divorced, Rogers stayed with her grandparents, Walter and Saphrona Owens, while her mother wrote scripts for two years in Hollywood. When she was nine years old, her mother got remarried to a man named John Logan Rogers. Ginger took the name of Rogers, although she was never legally adopted. They lived in Fort Worth, Texas, and her mother became a theater critic for a local newspaper, the Fort Worth Record. Rogers thought of teaching school as a teenager, but with her mother's interest in Hollywood and the stage, her exposure to the theater increased. Waiting for her mother in the wings of the Majestic Theater, she began to sing and dance along to the performers on stage. Five years later her entertainment career was born one night when the traveling vaudeville act of Eddie Foy (Bob Hope would play Foy in The Seven Little Foys) came to Fort Worth and needed a quick stand-in. She entered and won a Charleston contest and then left on a Vaudeville tour. Her mother and she would tour for four years. During this time her mother divorced John Rogers, but kept his surname. When only 17, she married Jack Culpepper, another dancer on the circuit. The marriage was over within months, and she went back to touring with her mother. When the tour got to New York City, she stayed, getting radio singing jobs and then her Broadway theater debut in a musical called Top Speed, which opened on Christmas Day, 1929. Her first movie roles were in a trio of short films made in 1929—Night in the Dormitory, A Day of a Man of Affairs, and Campus Sweethearts. Within two weeks of opening in Top Speed she was hired to star in Girl Crazy, by George Gershwin and Ira Gershwin. Fred Astaire was hired to help the dancers with their choreography, and he briefly dated Rogers. Her appearance in Girl Crazy made her an overnight star at the age of 19. In 1930, she signed with Paramount Pictures for a seven-year contract. Rogers would soon get herself out of the Paramount contract and move with her mother to Hollywood. When she got to California, she signed a three-picture deal with Pathé, which resulted in three forgettable pictures. After getting bit parts for singing and dancing for most of 1932, in 1933, she made her screen breakthrough in 42nd Street, with Warner Brothers. She went on to make a series of films with RKO and, in the second of those, Flying Down to Rio (1933), she again met up with Fred Astaire. Rogers made ten films as Fred Astaire's romantic interest and dancing partner that revolutionized the genre. She is considered to have been Astaire's finest dance partner, principally due to her ability to combine dancing skills, natural beauty, and exceptional abilities as a dramatic actress and comedienne, thus truly complementing Astaire: A peerless dancer who sometimes struggled as an actor and was not considered classically handsome. The resulting song and dance partnership enjoyed a unique credibility in the eyes of audiences. Although the dance routines were choreographed by Astaire and his assistant Hermes Pan, both have acknowledged Roger's input into the process, and have also testified to her consummate professionalism, even during periods of intense strain as she tried to juggle her many other contractual film commitments with the punishing rehearsal schedules of Astaire, who made at most two films in any one year. Ginger Rogers also introduced some celebrated numbers from the Great American Songbook, songs such as Harry Warren and Al Dubin's "The Gold Diggers' Song (We're in the Money)" from Gold Diggers of 1933 (1933), "Music Makes Me" from Flying Down to Rio (1933), "The Continental" from The Gay Divorcee (1934), Irving Berlin's "Let Yourself Go" from Follow the Fleet (1936) and the Gershwins' "Embraceable You" from Girl Crazy, and "They All Laughed (at Christopher Columbus)" from Shall We Dance (1937). Furthermore, in song duets with Astaire, she co-introduced Irving Berlin's "I'm Putting All My Eggs In One Basket" from Follow the Fleet (1936), Jerome Kern's "Pick Yourself Up" and "A Fine Romance" from Swing Time (1936), and the Gershwins' "Let's Call the Whole Thing Off" from Shall We Dance (1937). In 1939, Rogers requested a break from musicals saying, "I don't want to make a musical for the next year. Don't get me wrong—I'm not ungrateful for what musicals have accomplished for me. However for the last four years I've been doing the same thing with minor variations." After breaking with Astaire, her first role was opposite David Niven in Bachelor Mother. In 1941, Ginger Rogers won the Academy Award for Best Actress for her starring role in 1940s Kitty Foyle. She enjoyed considerable success during the early 1940s, and was RKO's hottest property during this period, however, by the end of this decade her film career was in decline. Arthur Freed reunited her with Fred Astaire for one last time in The Barkleys of Broadway (1949) which, while very successful, failed to revive Roger's flagging career, although she continued to obtain parts throughout the 1950s. In later life, Rogers remained on good terms with Astaire: She presented him with a special Academy Award in 1950, and they teamed up in 1967 as co-presenters of individual Academy Awards. The Kennedy Center honored Ginger Rogers in December 1992, an event which when shown on television, was somewhat marred when Astaire's widow, Robyn Smith (who permitted clips of Astaire dancing with Rogers to be shown for free at the function, itself), was unable to agree terms with CBS for broadcast rights to the clips. In 1940, Rogers purchased a 1000-acre ranch between Shady Cove, Oregon and Eagle Point, Oregon, along the Rogue River, just north of Medford. The ranch, named the 4-R's (for Rogers's Rogue River Ranch), is where she would live, along with her mother, when not doing her Hollywood business, for 50 years. The ranch was also a dairy, and supplied milk to Camp White for the war effort during World War II. Rogers loved to fish the Rogue every summer. She sold the ranch in 1990, and moved to Medford. Rogers's first marriage was to her dancing partner Jack Pepper (real name Edward Jackson Culpepper) on March 29, 1929. They divorced in 1931, having separated soon after the wedding. In 1934, she married her second husband, actor Lew Ayres (1908–1996). They separated quickly and were divorced in 1941. In 1943, she married her third husband, Jack Briggs, a Marine. They divorced in 1949. In 1953, Rogers married her fourth husband, lawyer Jacques Bergerac. 16 years her junior, he became an actor and then a cosmetics company executive. They divorced in 1957 and he soon remarried actress Dorothy Malone. In 1961, she married her fifth husband, director and producer William Marshall. They divorced in 1971. Rogers would spend the winters in Rancho Mirage, California, and the summers in Medford, Oregon. Ginger Rogers died on April 25, 1995, of congestive heart failure, at the age of 83, in Rancho Mirage, and was cremated. Her ashes are interred in the Oakwood Memorial Park Cemetery in Chatsworth, California. Rogers was outstanding among Astaire's partners not because she was superior to others as a dancer but because, as a skilled, intuitive actress, she was cagey enough to realize that acting did not stop when dancing began… the reason so many women have fantasized about dancing with Fred Astaire is that Ginger Rogers conveyed the impression that dancing with him is the most thrilling experience imaginable. Rogers was a founding member of the Motion Picture Alliance for the Preservation of American Ideals. The Craterian Ginger Rogers Theater in Medford, Oregon, is named in her honor. This page was last modified on 21 June 2017, at 19:52.